What Is Wire-Pulling Compound or Cable Lube? 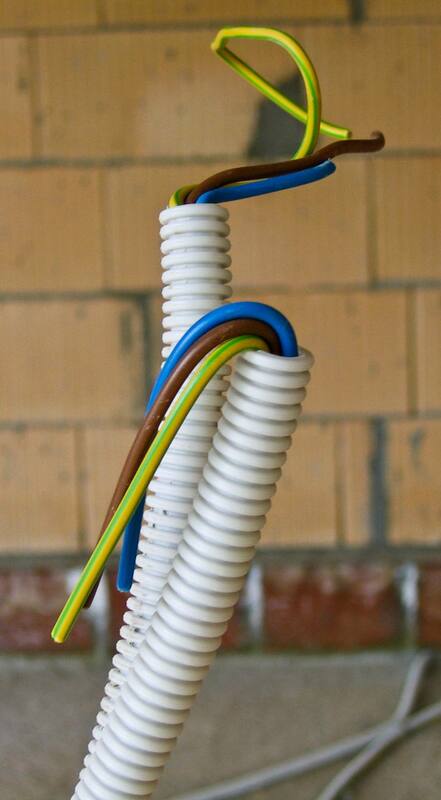 Running individual wires through a conduit can be quite a task if the conduit run is long or has several bends in it. Wire-pulling compound, also called cable lube or lubricant, is designed to make it easier to pull electrical wires and cables through conduit runs. It comes in a few different forms and reduces the coefficient of friction between wires and conduits to help minimize damage to the wire insulation or cable jackets and make pulling smoother, safer, and faster. Liquid lubricant can be poured into the conduit along with the wiring and will drip from exposed wiring. For this reason, liquid is best for vertical or downhill runs of conduit when it's convenient to pour the liquid into the conduit. There are also liquid lubricants in spray form. Gel lubricants can be applied to wiring before it enters the conduit and does not drip off like liquid lubes. Gel is best for overhead applications or wherever dripping lube is problematic. Wax lubricants perform similarly to gel lubes (they stick to wires and do not drip) but are more heat-tolerant than gels, making them preferable for hot-weather situations. All types of wire-pulling compound are nonconductive, or electrically neutral, making them safe for electrical work and all types of electrical wiring and cable. Cable lube is odorless, non-toxic, and non-corrosive and does not require skin protection. However, because lube is so slippery, be cautious not to get any on your shoes. Spilling lube on ladder steps or rungs can be particularly hazardous. Most lubes clean up easily with soap and water and leave no residue. Wire-pulling compound is added to the wires as they are being pulled into the conduit. The person feeding the wires makes sure they go straight into the conduit, using one hand to lube the wires at the same time. Spray-type lubricant can be sprayed onto the wires directly as it is being fed, leaving your hands free of the slippery substance. Attach electrical wires to a fish tape for pulling by stripping the wires back and wrapping them through the eye of a fish tape. This will ensure the wires will not come off during the pull. Wrap the wires and the end of the fish tape with electrical tape. Apply cable lube generously to the head of the wires feeding into the pipe and a few feet down the length of the wire. Also, squirt a bit of lube down the conduit itself. Continue applying a small amount of lube to the wires just before they enter the conduit as the wires are pulled into the pipe. Often, the easiest method is to squirt the lube into the palm of one hand, allowing the wires to drag through it as they are pulled into the conduit. Try to keep the other hand free of the lubrication so you can grip the cable lube bottle and the wire for feeding. Reduce the amount of lube applied as you approach the end of the wire pull, or when the wire pulling gets easier. At this point, most of the wire and conduit have been lubricated enough to finish the wire pull with ease. To summarize: Lubricate the head of the pull very liberally, and generously add more lube every few feet when starting the pull. From there, you can add some every 5 feet or so, and use less toward the end of the pull.